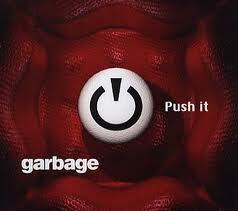 “Push It” is an alternative rock song written, produced and performed by Garbage. “Push It” was the lead single released from their second album Version 2.0 and became a worldwide hit in 1998. Incorporating a melodic line from Beach Boys hit “Don’t Worry Baby”, “Push It” was critically acclaimed, receiving nominations at that year’s MTV Europe Music Awards and at the Miami Winter Music Conference. The music video for “Push It” went on to receive eight nominations at the MTV Video Music Awards. In 2007, “Push It” was remastered and included on Garbage’s greatest hits album Absolute Garbage. “Push It” was written and recorded at Smart Studios during the 1997 sessions for Version 2.0. Bass on “Push It” is performed by Daniel Shulman. “Push It” contains an interpolation of Californian band the Beach Boys hit “Don’t Worry Baby” which was written by members Brian Wilson and Roger Christian and 1980s act Salt-N-Pepa’s “Push It” written by Herbie Azor. Garbage originally sampled the actual Beach Boys vocal track, but it wouldn’t work with the song, so Shirley re-sung the lyric. After debating whether to keep the line, they sent a tape to Brian Wilson, who gave them permission to use the sample, and also said he liked the song and asked if he could keep the tape. Garbage is an alternative rock band formed in Madison, Wisconsin in 1994. Comprising Scottish vocalist Shirley Manson and American musicians Duke Erikson, Steve Marker and Butch Vig, the band has counted worldwide album sales of over 17 million units.